Equality for Flatbush defines ‘gentrification’ as a concerted, deliberate effort to price out low-to-middle income residents from neighborhoods by city government, corporations, real estate developers, and landlords in favor of renting, selling, and catering to people of higher and/or more flexible incomes. We see gentrification as an intersectional issue that is deeply connected to the ways that race, class, gender, sexuality, gender identity, age, ability, nation of origin, immigration status, physical and mental capacity, etc. impact individuals and our communities. 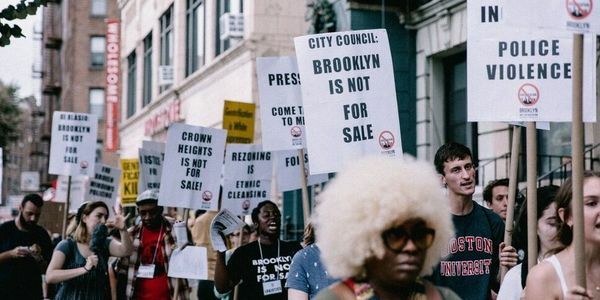 For this very reason, we believe that all of us-long-time and new residents, communities of color and white communities, low-income and middle-class people – have a stake in the urgent struggle to save affordable housing in Brooklyn. Scroll to view information about all campaigns, or click each link below to go directly to that section. Scroll to view information about all campaigns. These 45 residents lived across 12 Brooklyn neighborhoods: Bedford-Stuyvesant/Clinton Hill, Bensonhurst, Canarsie, Crown Heights, Cypress Hill/Brownsville, East Flatbush, East New York, Flatbush, Park Slope, Prospect Heights, Sunset Park, and Williamsburg. E4F also conducted 2 campaigns for tenants living in The Lower East Side and Queens, NY . Equality for Flatbush : E4F profusely thanks filmmaker Shaquille Romblay for this AMAZING anti-#gentrification video! Just a saw a #BeforeItsgone Sticker ??? Looking for more videographers and editors to volunteer on The BEFORE IT’S GONE // TAKE IT BACK (B4G) Tenant Harassment Documentation Team which is part of our ‪#‎NoEvictionZone‬ campaign. 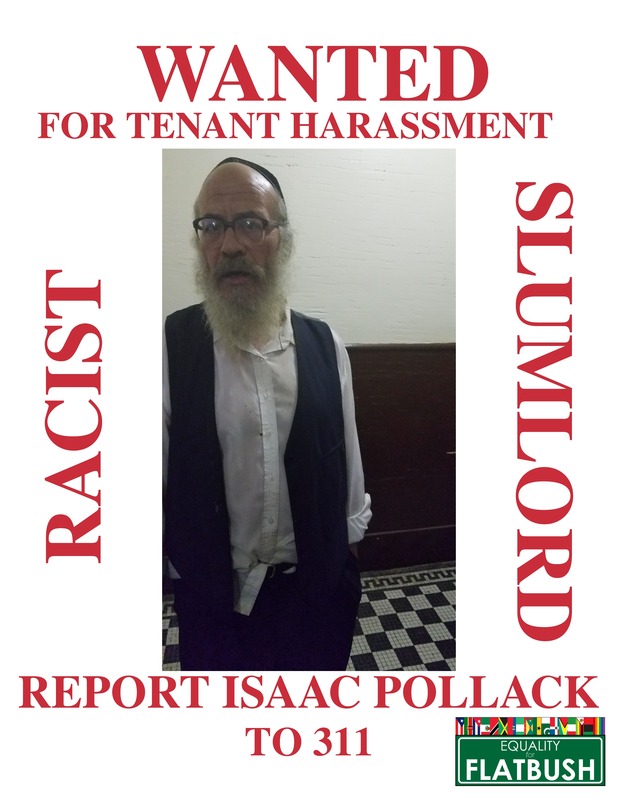 Tenant Harassment RAMPANT & REAL! We are looking for more video and film folks to help get out the stories of courageous tenants standing up against their landlords in Brooklyn Housing Court or organizing their neighbors in their buildings. Have an idea for a project? — WE WOULD LOVE TO HEAR ABOUT IT! On February 28th 2019, Equality for Flatbush received a report of tenant harassment and intimidation of 748 St Marks Ave tenant leader by a representative of the building’s management, Europi Equities LLC. A man identifying himself as “Steve” called a tenant leader the morning of a scheduled tenant association meeting to inform her that Europi Equities knew that she had distributed flyers for the meeting throughout the building. He then chastised her for organizing with her neighbors, as well as revealing he had personal info about where she worked. Please sign and circulate the Petition to help the 748 St Marks Ave Tenants Fightback! Equality for Flatbush has documented severe lack of repairs at 748 St. Marks Ave. in Crown Heights. Many apartments’ amenities haven’t been renovated since tenants first moved in during the 1970s. Tenants report poor heating, rodent infestations, outdated facilities, mold, mildew, and water damage. Tenants are demanding that the landlord, Eve Vasilantonakis, make critical repairs and renovations. As the owner, Isaac Hager is responsible for making sure that this building is secure for tenants. That’s why tenants are demanding that Isaac Hager (1) replace the broken door with a new door that is secure; and (2) install a security camera and a functional intercom system. The Brooklyn Anti-Gentrification Network (BAN) in solidarity with our member organization Mi Casa No Es Su Casa opposes the current plan to rezone the neighborhood of Bushwick as endorsed by Brooklyn Community Board 4 with Council Members Antonio Reynoso and Rafael Espinal. We know all too well that the process of rezoning, the change of land use initiated under the guise of community preservation and additional affordable housing, far too often becomes a hostage situation where communities bargain for crumbs with the city or risk getting nothing. The general public should understand that rezoning is an opportunity for real estate interests to raise real estate prices and their subsequent abilities to make profits under our feet, and that no level of additional services or amenities that our neighborhoods already deserve should be used to justify this fact. When Mayor De Blasio was first elected mayor in 2013, his answer to the city’s housing crisis was a plan that called for the construction and preservation of 200,000 affordable units across the city. The majority of this goal would be through saving units from falling out of the state’s rent stabilization program but 80,000 of that number would be newly built in fifteen communities chosen to be rezoned for increased density to accommodate that new construction. In addition, the city passed a new housing policy, known as Mandatory Inclusionary Housing, to encourage more affordable units across the city, but only mandatory after a neighborhood is rezoned. This policy was the supposed solution to counteract the a wave of market rate development coming not only to the targeted communities of the rezonings but citywide. But what happens when affordable housing isn’t affordable enough for the community already there? During the Bloomberg administration, dozens of neighborhoods were rezoned in ways that changed the rental landscape of the city, often subsidized by programs such as the 421a tax abatement and with very few demands of developers for affordable housing and no protections for current tenants. One of the worst examples was the Williamsburg and Greenpoint waterfront rezoning, where in exchange for an upzoning that would allow 20 and 30 story towers, promises were made but not kept and new developments have led to the displacement of tens of thousands of former rent stabilized tenants and small businesses within the rezoned and adjacent areas. We as the residents of this city must recognize this Freudian slip for the truth it holds of this process. The goal of the dozens of small meetings behind closed doors has never been to address the needs of Bushwick residents for better enforcement of tenant law against landlords, seek to use land available for the creation of affordable housing or for additional municipal services – school seats, public transportation, garbage removal, etc – that many local residents have advocated for in good faith. What has actually happened is an illusion of democracy that is being calibrated to both meet the mayor’s intended quota for the neighborhood and minimize potential community backlash. 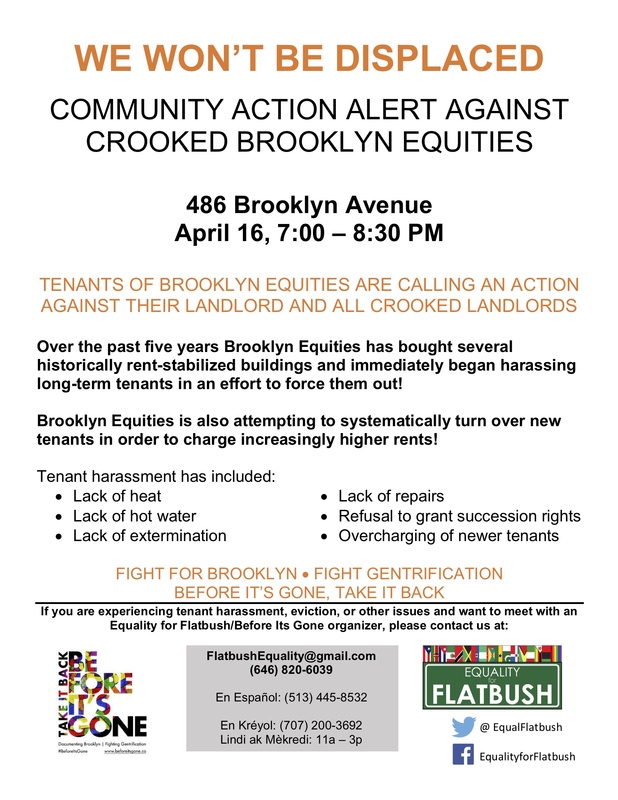 The Brooklyn Anti-Gentrification Network demands no more rezonings as a tool to allow record real-estate profits in the name of community preservation and for the Bushwick Plan Steering Committee to end this process before irreparable harm is done to the neighborhood. 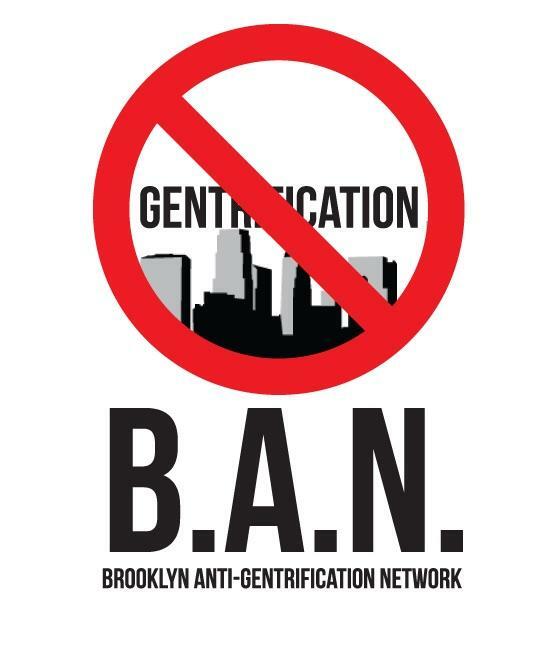 The next Brooklyn Anti-gentrification Network meeting is on 2/25 at 7p at the 2nd floor of the NYC Solidaity Center located at 147 W 24th St, New York, NY 10011. Real Estate Watch (REW) works to hold predatory landlords and developers accountable by providing empirical information and tools to empower Brooklyn residents and small businesses. Real Estate Watch (REW) is the investigative research project of Equality for Flatbush. 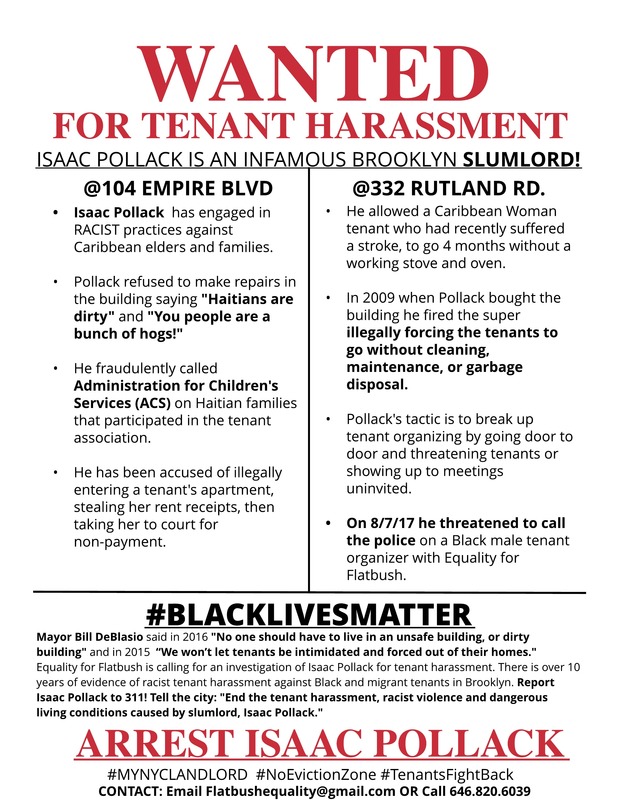 Since 2017, Equality for Flatbush has been fighting with several Black homeowners who have sustained thousands of dollars of damages because of predatory developers who “house flip”. These predatory develops purchase property next to a long-time Black homeowner, damage the homeowner’s property which leads to lengthy and costly court battles. Several homeowners have reported that they believe the developer had purposely damaged their property in order to get them to sell their homes. 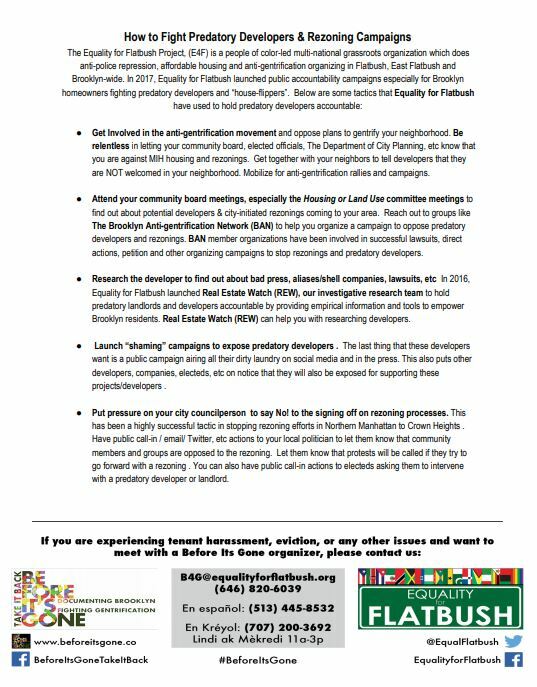 Real Estate Watch, Equality for Flatbush’s investigative research team, has released a fact sheet on Rafael Manor who has been identified as one of these predatory developers. Enjoy. Selene Finance has been identified to us by homeowners in our community as a key target due to their predatory practices. Real Estate Watch, Equality for Flatbush’s investigative research team, has released a fact sheet to document the key players profiting off Selene Fianance and their fraudulent practices. The intent of this initiative is to bring new residents together, building by building, block by block, in solidarity against the skyrocketing rents and property grabs by developers that is transforming our neighborhoods. Contact us for information on how to get involved.